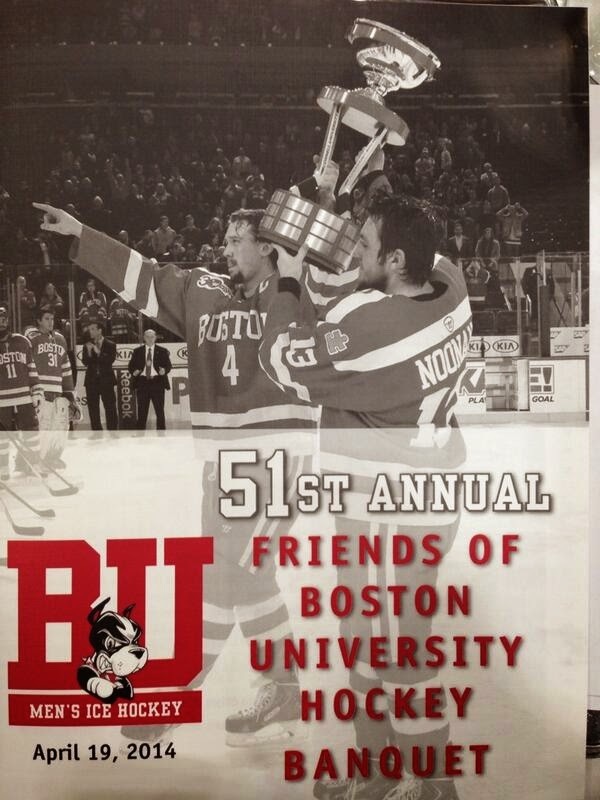 Senior co-captain Garrett Noonan was named winner of George V. Brown MVP award at last night’s the 51st Friends of BU Hockey Banquet. Noonan, a four-year blueline standout was unable to attend, however, as he’d signed an entry level contract with Nashville and was assigned to AHL Milwaukee. The Meryl Herman Award for Outstanding Contribution to the Hockey Program was presented for only the 5th time and went to the reporters from the Daily Free Press who covered every game, home and away. Defenseman Matt Grzelcyk was announced as captain of the 2014-15 Terriers, with Cason Hohmann and Evan Rodrigues serving as assistant captains. Head coach David Quinn announced that next season’s schedule will include 22 Hockey East games (with UConn joining the conference), home games against Michigan, Michigan State and newly crowned NCAA champion Union College, and two away games against Wisconsin and another road game at Rensselaer. In addition, there will be an exhibition game at Walter Brown Arena against the United States Junior National Team, which will spend five days training at WBA for the 2015 IIHF World Junior Championship. 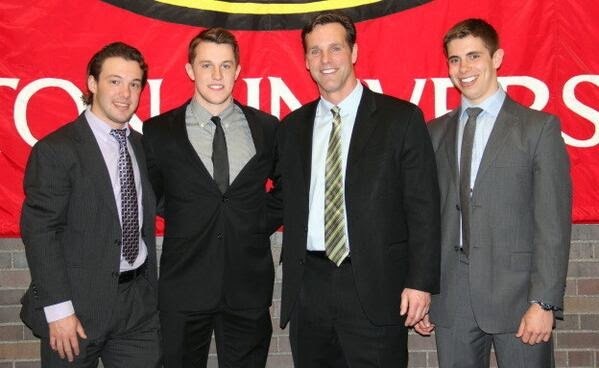 ● Visit The Friends of BU Hockey Twitter account for more photos from last night’s banquet. Photos by Richard Wolowicz (HHOF-IIHF Images). 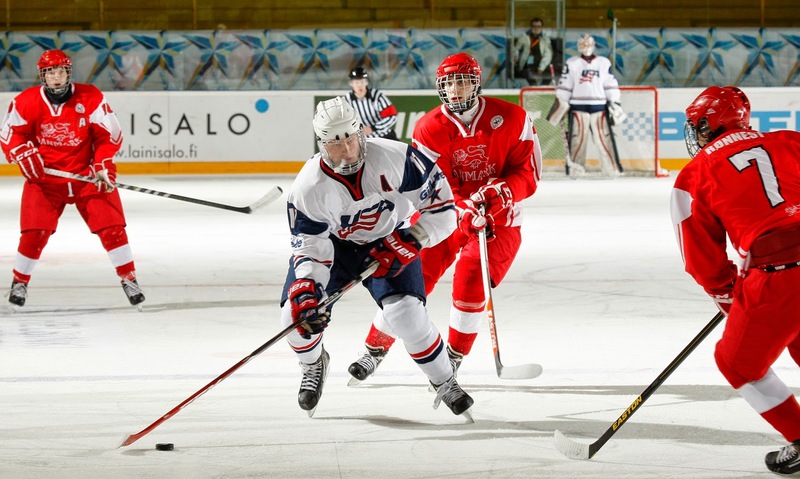 2014 recruit Jack Eichel (photo) scored twice and added an assist for Team USA in a 7-0 drubbing of Denmark in the IIHF World U18 Championships. Team USA improved its record to 2-1. Eichel had registered assist on Saturday in a 3-0 blanking of the Czech Republic. 2014 recruit Johnathan MacLeod, who like Eichel, is wearing the assistant captain’s “A,” finished plus 3 for the game, while Eichel was +4. With his three-point night, Eichel has 81 points (35G, 46A) in 49 games Next up for Team USA is the final preliminary round game against host Finland on Tuesday. Kevin Shattenkirk scored a goal and added two assists—including one on the tying goal in the final seconds of regulation—as the Blues’ defeated the Blackhawks, 4-3 in overtime, giving St. Louis a 2-0 lead in the first round series. The former Terrier captain leads St. Louis in playoff scoring with four points. Charlie Coyle scored his second goal in as many playoff games, but the Wild fell to Colorado, 4-2, and trail in the series, 2-0. Alex Chiasson scored his first career playoff goal but Dallas fell, 3-2 to Anaheim and trails 2-0 in the series.